Nowadays, lots of news about Iran’s flood disaster is aired. The disaster struck 28 out of 31 provinces in Iran so that it looks like impossible to estimate the casualties and financial damages. “The resources of the Revolutionary Guard Corps, Army and the government must be placed at the disposal of people. The regime must open the way for international relief efforts. However, it has so far obstructed national cooperation and international aid,” Mrs. Rajavi stipulated. The devastating flash floods and its victims and extensive damages constitute a national disaster whose culprit is the anti-human clerical regime. Firstly; deforestation and eliminating the vegetation, particularly in Golestan Province. Secondly; construction non-standard and unnecessary dams, many of them were cracked or collapsed during the recent rains. Although plundering Iran’s natural resources by the regime’s agents led to the national flood, and brought more plight for the Iranian people, but the regime will face with the crises in the aftermath of the floods. As a matter of fact, because the socio-economic consequences of the national flood disaster concern the regime’s official greatly, they are making an all-out effort to conceal the truth about the dimensions of the flood’s damages. 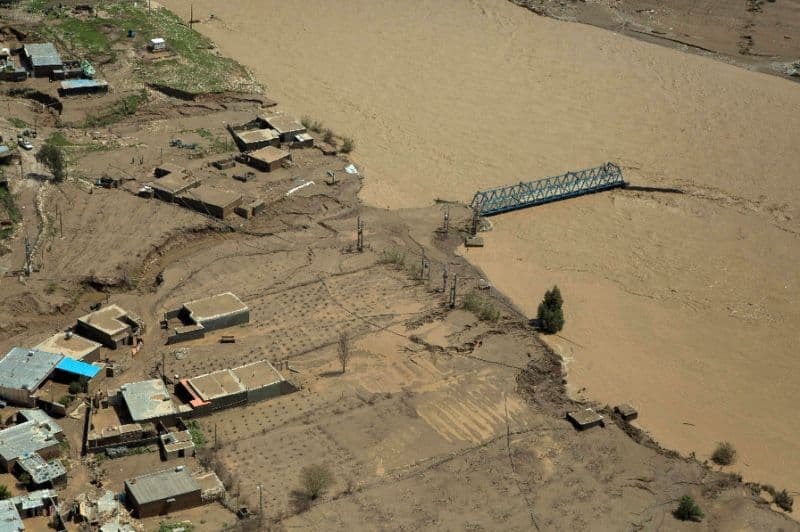 “I urge Iran’s courageous youths and the popular councils to rush to the aid of affected victims of flash floods in the three provinces of Lorestan, Khuzestan, and Ilam,” Mrs. Rajavi added. Firstly; facing with an army of indignant flood-hit people who have lost all belongings and even their loved ones due to the mismanagement of the regime and the destruction of the environment by its agents, in particular the IRGC. Secondly; the public demands for prosecution of the perpetrators of the environmental destruction that caused the national flood disaster. The fear of this demand is mirrored in the stances of the regime’s rival faction who accuse each other of negligence. Thirdly; because of the corruption and misgoverning, the dire economic condition crisis has been a long overdue crisis for the regime. Destruction of thousands of homes, villages, farms, workplaces, factories as a result of the devastating flood, has made the economic crisis more acute for the regime. Fourthly; the crisis of spreading lethal diseases because of the destruction of infrastructures and lack of sanitary facilities. Fifthly; joining a massive number of flood-hit and homeless people to the jobless army which will cause more social protests. As a result, the regime is unable to solve the most basic needs of the society, because of its oppressive, plunderer, and warmongering nature. This regime neither intends nor can do something for the flood-hit people. The people blame the regime and particularly the IRGC, not nature, for massive damages and casualties. The treacherous and corrupt policies of the regime incite the public wrath which will push the regime to the brink of overthrow. Mohammad Pakpour, commander of the Islamic Revolutionary Guards (IRGC) ground forces acknowledged the people’s anger after he visited the flood-ravaged town of Poldokhtar in Lorestan province. While he was bombarded by the anger and complaints of the people during his visit, he admitted that no official dares to come to Poldokhtar out of fear of facing the people’s wrath. The regime’s officials are continuously warning each other about the explosion of anger of the people, which attests the readiness of the society to get rid of this regime that has only a 40-year record of failure, destruction, and repression.